Go Northwest! - Page 2 of 5 - A location-based ongoing commentary about points of interest in the Pacific Northwest. McKenna Creek provides a few minutes of pleasant paddling quite different from the lake paddling as canoeist near the completion of a 72-mile circuit of a chain of 11 lakes in Bowron Lake Provincial Park, British Columbia. 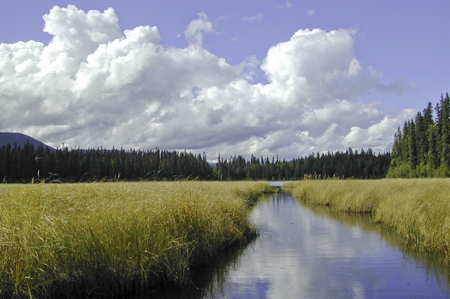 The park, which is located about 85 kilometers east of the town of Quesnel, is a beautiful setting of deep lakes and high mountains popular with both kayakers and canoeists. Campgrounds are well maintained and have campfire pits or areas and strong metal bins for protecting food from bears. Some campgrounds also have primitive cabins. McKenna Creek, Bowron Lake Provincial Park, British Columbia. This entry was posted in British Columbia and tagged Bowron Lake Provincial Park, British Columbia, canoeing, kayaking, McKenna Creek, Quesnel on September 26, 2012 by Jack High. 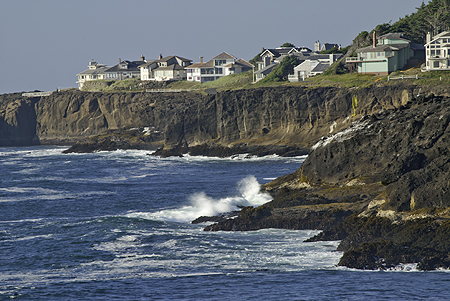 Homes in Depoe Bay, Oregon line the cliffs of the Oregon Coast just north of Whale Cove. The view is looking north from the picnic area at the Rocky Creek State Wayside. GPS coordinates: N 44, 47.14; W 124, 4.42. Homes at Depot Bay, Oregon overlooking the Pacific Ocean. This entry was posted in Oregon, Oregon Coast and tagged Depoe Bay, Oregon, Oregon Coast, Whale Cove on September 21, 2012 by Jack High. Wranglers round up horses at the Elk Horn Ranch of Gallatin Gateway, MT, a small town on US Highway 191 between Big Sky and West Yellowstone, Montana. 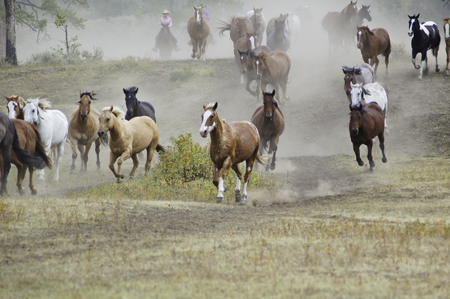 The Elk Horn Ranch is a dude ranch featuring seven-day ranch vacations. This entry was posted in Montana and tagged dude ranch, Elk Horn Ranch, Horse Roundup, Montana on September 19, 2012 by Jack High. 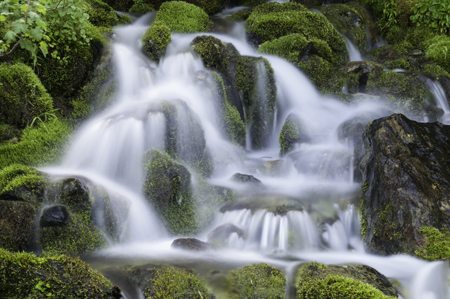 This beautiful, but unexpected, waterfall will be found at a sharp curve on US Forest Service road 517, otherwise known as the Seven Devils Road, that leads to Heavens Gate Lookout from the town of Riggins, Idaho. GPS coordinates: N 45, 23.3308, W 116, 27.3219. Elevation: 6,089 feet/1856 meters. 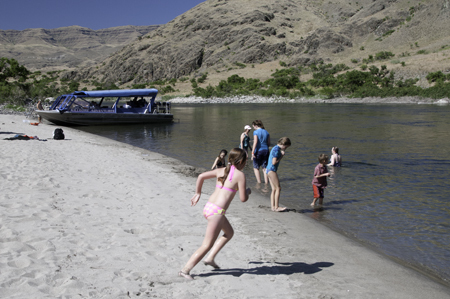 The lookout, at an elevation of 8,100 feet, offers splendid views of the Seven Devils Mountains as well as Hells Canyon. Waterfall on Papoose Creek lies along side Seven Devils Road leading to Heavens Gate Lookout. This entry was posted in Idaho and tagged He Devil, Heavens Gate, Hells Canyon, Riggins, Seven Devils, She Devil on September 13, 2012 by Jack High. One of the delights of travel is making new discoveries such as Koehoe’s Agate Shop in Bigfork, Montana. Koehoe’s has a well respected reputation for offering quality gem stones from around the world including agates, jade, opals and many other prized and precious gems. Many of Koehoe’s gems find their place in high-end, custom-made jewelry comparable to what one would find in prestigious jewelry stores around the world including rings, bracelets, necklaces, ear rings, broaches and assorted pins. 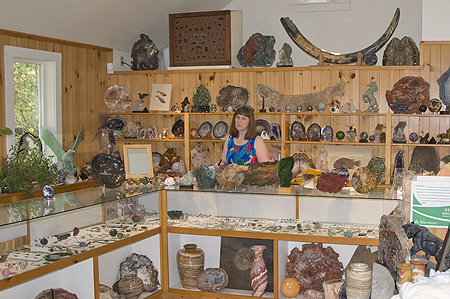 The shop also is home to an assorted collection of rocks and minerals fashioned into a variety of art objects, some of which are in the shape of large rectangular slabs cut and polished to reveal images of various sea creatures including fish, stingrays and the chambered nautilus. These slabs make beautiful accent pieces or perhaps could be used as counter or table tops. Particularly impressive is a variety of fossilized chambered nautilus shells. Josh Covill and Muir Van Rinsum, two of the shop employees, explained that when the creature inhabiting the shell dies, the shell sinks to the ocean floor where it eventually becomes covered and buried in mineral rich sediment. The fossilization process preserves the design and shape of the shell in extraordinary detail and beautiful colors. The colors, often seen as iridescent greens, reds, yellows and blues are indicative of the particular minerals in the sediments. The shop is such a rare and enjoyable place in which to browse, I could not resist making a small purchase. Remembering I had in my pocket an old money clip still used but which no longer bore the original scrimshaw inlay; Muir helped me find the perfect piece of jade to replace the lost scrimshaw. 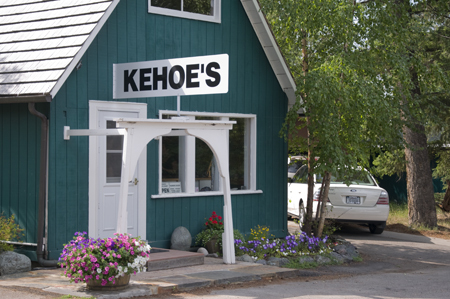 You will find Koehoe’s Agate Shop at 1020 Holt Drive, Bigfork, Montana. Phone: 406-837-4467. This entry was posted in Montana and tagged agates, Bigfork, gems, Kehoe's Agate Shop on August 26, 2010 by Jack High. I’m visiting Ashford, Washington for the weekend to attend the town’s “On the Road to Paradise” First Annual Spring Wine Tasting event on Saturday. First stop was to check in with Jasmer’s Cabins at Mount Rainier to pick up a key and directions to my cabin for the weekend. Met my hosts and owners of Jasmer’s Cabins, Luke and Tanna. They greeted me with a warm welcome and cheerfully provided answers to my questions about the area. Luke and Tanna had chosen a newly remodeled cabin for me located in a quiet location yet not far from the town of Ashford, nearby restaurants and the entrance to Mount Rainier National Park. Cabin was fully equipped with TV, hot tub, and barbeque. Very comfortable and restful place to stay, yet close to the mountain and various services. This entry was posted in Washington and tagged Mount Rainier, Mt. 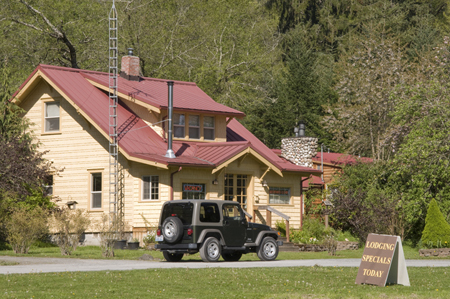 Rainier, Rainier accommodations, Rainier cabins, Rainier lodging on May 13, 2010 by Jack High. 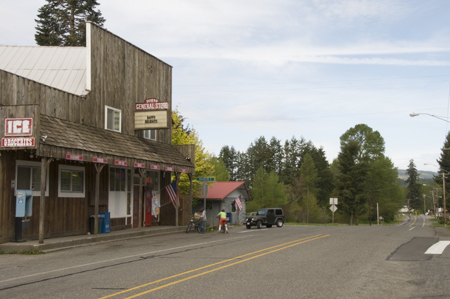 There’s more than meets the eye at Ashford, Washington. First impression is that of a sleepy little community that’s not much more than a speed bump along State Route 706 for slowing down the traveler in a hurry to reach Mount Rainier National Park and experience the grandeur of the 14,410-foot mountain that is the centerpiece of the park. On one side of the highway, you’ll find the US Post Office and Suver’s General Store. 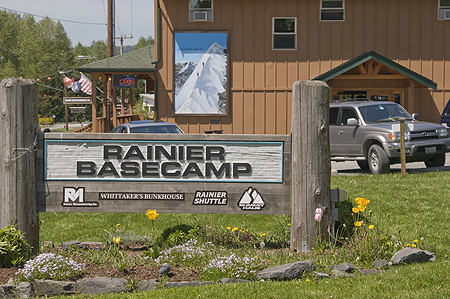 On the other side, you’ll see several buildings including a restaurant and a small complex of buildings known as Rainier Basecamp that house a number of local merchants and businesses including Whittaker’s Bunkhouse; Rainier Mountaineering, Inc.; Summit Haus and the Mt. Rainier Visitor Association’s visitor center. What’s unseen are dozens and dozens of cabins offering rest and respite in beautiful natural settings including creeks and forest canopies scattered in and among the woods on either side, up and down and off the highway leading to Mount Rainier. The cabins also make excellent base camps for lingering in the area to truly get to know the mountain and enjoy it’s many attractions including wildlife, old-growth forests, creeks and rivers, wild flowers, hiking trails and incredible scenery. 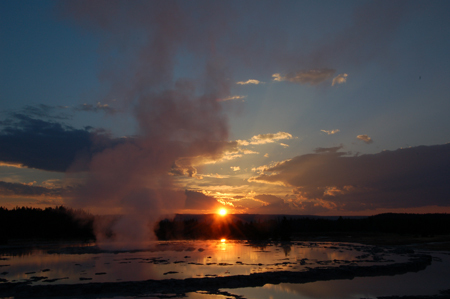 Other options for accommodations in and near Ashford include bed and breakfasts, vacation rental properties and inns and lodges. 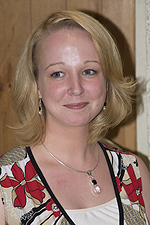 Tanna Osterhaus, who, with her husband Luke, owns Jasmer’s Cabins at Mt. Rainier, says, “People who visit Rainier for just a day or night often don’t come back. But people who stay two days wish they could stay longer and often do come back.” The latter are the ones who discover there is much to enjoy and appreciate the time to slow down, disengage from worldly affairs, and relax in one of the most beautiful and remarkable places in the world. 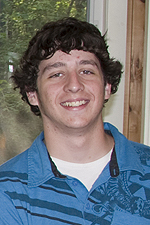 This entry was posted in Washington and tagged Ashford, Ashford Washington, Mount Rainier, Mt. Rainier, Road to Paradise on May 13, 2010 by Jack High. 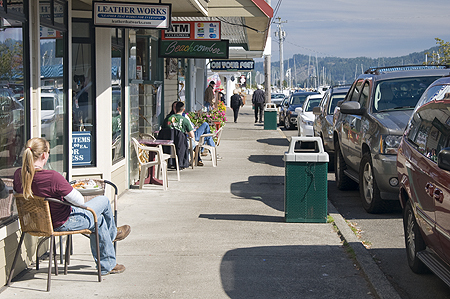 Strolling along Bay Street in the Old Town district of Florence, Oregon, a section of town that is a favorite of many local residents as well as tourists and other travelers. The popular area hosts numerous and various shops including art galleries, restaurants, and many stores offering antiques, clothing, gifts, candy, ice cream and other specialty foods. 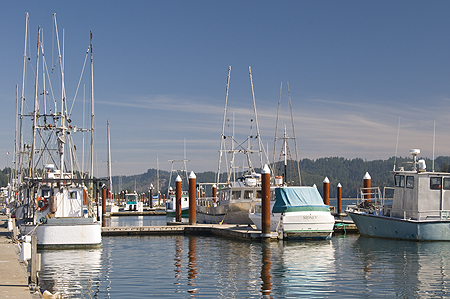 At the east end of Bay Street is the Port of Siuslaw Marina serving recreational and commercial boaters and fishermen. The marina features a commercial wharf and docks, waterfront boardwalk and a RV campground. This entry was posted in Oregon, Oregon Coast and tagged Florence, Florence Old Town, Florence Oregon on October 8, 2009 by Jack High.